Who doesn’t like to make something for free? After many wood projects, I’ve been left with a large pile of wood scraps. Slowly, I’ve been organizing and working my way through the pile and planning some useful things to build with them. 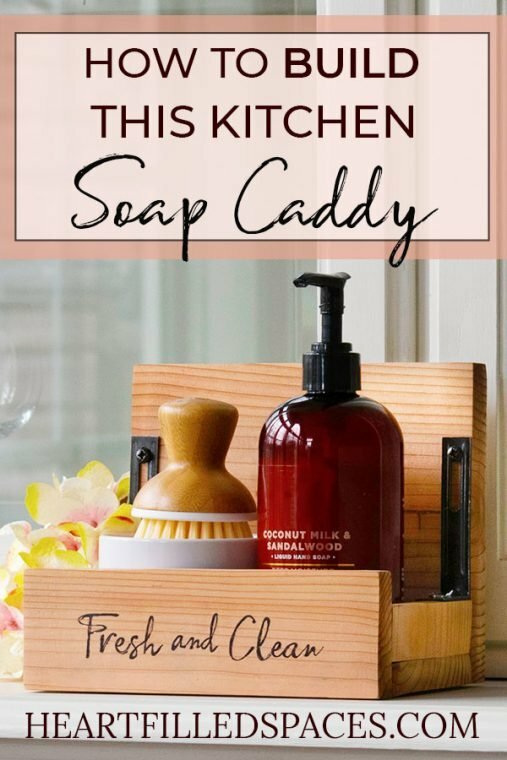 That’s how I came up with this DIY Kitchen Soap Caddy. I keep seeing all of these cute ways to store your kitchen soap/lotion, but I don’t want to buy a subscription to anything or spend extra money. So, I got to thinking that maybe I could use my cedar wood scraps to make one. 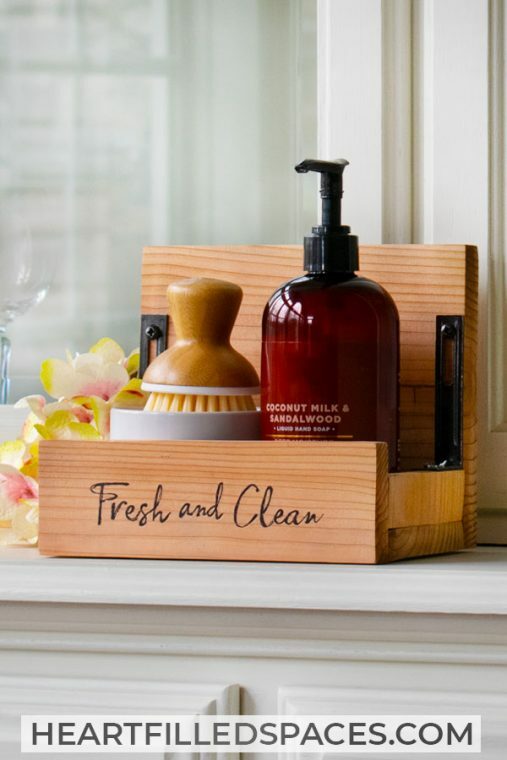 This Kitchen Soap Caddy went together so easy. I love projects that are quick and simple! My cedar boards were already sanded and some of the scraps were the right size. I measured my hand soap bottle and pot scrubber and then built it to accommodate those dimensions. Here is how to make it. 8 – 3/8″ wood screws. The screws that come with the corner braces are too long. The cedar pickets are only 1/2″ thick. Brad Nails – I use Porter & Cable and like the packs with multiple length nails. Choose the image or words for the front of your caddy and print on computer paper or cut out with vinyl on your Silhouette or Cricut. I use a Silhouette Cameo. Place your four corner braces on a piece of cardboard. Then press your screws into the cardboard so the head of the screw is facing up. Using your Rustoleum Oil Rubbed Bronze Spray Paint lightly coat the hardware and let dry. There are two ways you can add the words to the front of your project. Type your saying in a word processor and print it out. Coat the back of the paper (behind the words) with chalk. Tape the paper into place on the front piece of your project, taking care to center it properly. Next, trace the outline of the letters with a pencil. Remove the paper and you will see an outline of the letters on your wood piece. Trace the outline with your sharpie marker and then fill it in. Design your words/image in the design software of your cutting machine, then cut it out on vinyl. Weed the vinyl and place the image on transfer paper. Then center the image on your project and rub the back to transfer and remove the image from the transfer paper to the wood. If this works, you’re done. I could not get the vinyl to stick to the wood, so I rubbed the back of the transfer paper with firm pressure, being very thorough. Since cedar is a soft wood it left an impression of the image in the wood. I took my project to a well lit area and traced the impression with a fine point Sharpie marker and then filled it in. Another option would be to cut your image out, remove the words and use what is left as a stencil. Since some of these pieces are small, it will be easier to sand the board first. I started with a rough grit sandpaper and moved to fine grit for the final finish. Please be sure to wear eye & ear protection as well as a dust mask. Attach the back piece to the bottom piece with a clamp. Using 1 1/4″ brad nails, nail three brad nails from the bottom of the back piece into the long side of the bottom piece. Dry fit the side pieces and front piece into place. You will use two of the corner brackets to secure the front of the caddy to the side pieces on the inside of the box. With a pencil, lightly mark the screw hole placement, using your corner bracket as a guide. Then drill the four small pilot holes. Be careful to only drill in about 1/4″. Next, clamp the two side pieces into place and attach with brad nails from the bottom side of the bottom piece. Finally, attach the front piece to the side pieces with your corner brackets and 3/8″ wood screws in the previously drilled pilot holes. Next, place the two leftover corner brackets against the front of the back piece on top of the two side pieces. Mark your screw holes with a pencil and again drill the four pilot holes. Finally, attach the brackets with your 3/8″ wood screws. Fill in the holes on the back and bottom of your project with wood filler. Then use the lightest color wood marker to stain the wood filler to match the wood. 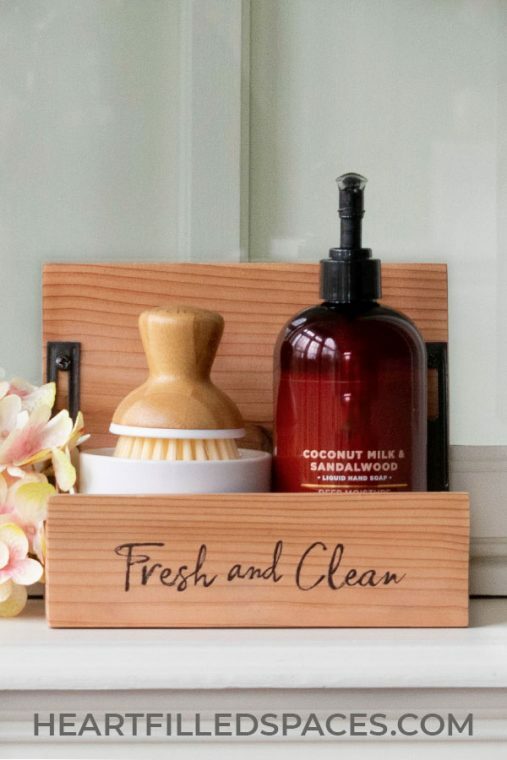 I chose to leave my Kitchen Soap Caddy with a natural finish. But, I will go back and coat it with a Polycrylic protective coat to prevent watermarks. 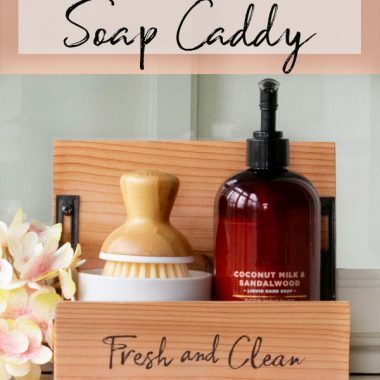 I love the way this DIY Kitchen Soap Caddy turned out! It has that rustic farmhouse style and the natural wood warms up my sink area. I hope you enjoy this project as much as I did! Check out these posts for other great DIY ideas! Let me know what you think in the comments below and thanks for stopping by!